To order your personalized subscription, click "I'M READY TO BUY" below or call 416-363-8231 (TOLL-FREE 1-800-250-4653). Thinking of a Premier or PICK series for the 2018/2019 Season? Go back. TIP: Comedy or a tearjerker? Will my kids like it? Which one inspired RENT? Get answers by calling Ticket Services at 416-363-8231 or visit the links below to build a FLEX4 package that’s ideal for you. 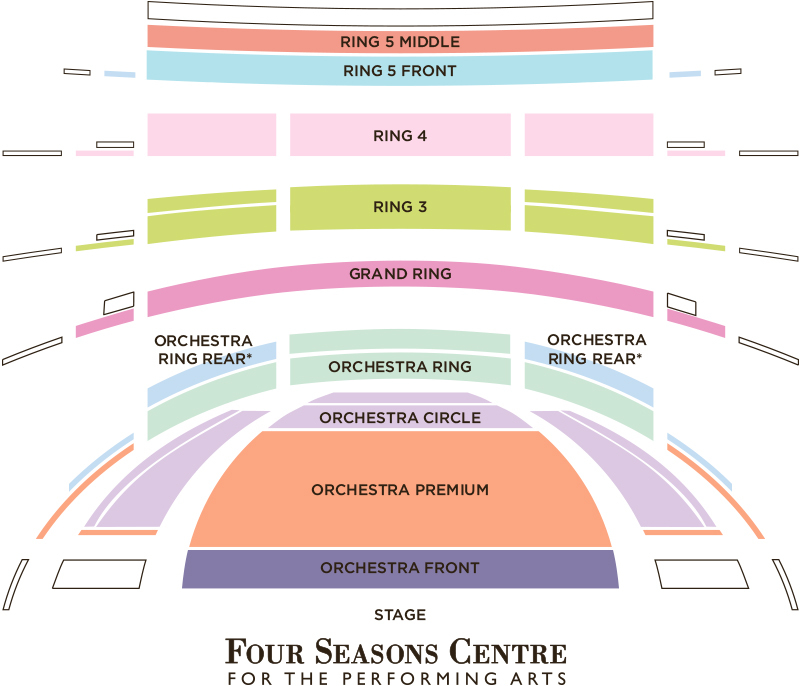 TIP: Take advantage of our special discounted performances (in blue) for all four operas or mix-and-match. TIP: Sit in the same section for all of your performances or experience different areas of the house. All ticket prices include a $4 handling fee ($16 per package), 13% HST and a $3.25 per-ticket Four Seasons Centre capital renewal surcharge. When ordering online, the $4 handling fee will not be included in the price. The entire $16 per package handling fee will be added to the final total. IMPORTANT INFORMATION: All sales are final and non-refundable. All ticket prices include a $4 handling fee ($16 per package), 13% HST and a $3.25 per-ticket Four Seasons Centre capital renewal surcharge. *Subject to availability, COC tickets are exchangeable for another performance of the same opera, up to—and no later than—one full business day prior to the original performance date. If exchanged into a higher priced performance/section, the patron will be charged the difference. Service fees apply and tickets cannot be exchanged from one opera title to another. Dates, prices, casting, repertoire and productions are subject to change without notice or compensation. Seating chart is not an exact representation of seating sections and may vary by performance.